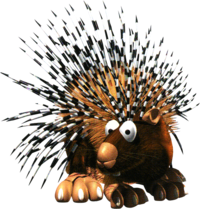 Spinies are porcupine enemies found in Donkey Kong Country 2: Diddy's Kong Quest. They are invulnerable to rear attacks or a stomp because of their pointy quills, but a frontal attack will quickly dispose of them. Occasionally, they are seen with a Klampon in front, "bodyguarding" them, as Klampons are kind of the opposite of Spiny (invulnerable to front attacks, but vulnerable from top). Spinies also appear in Donkey Kong Land 2. There is no real difference between the Spinies of this game and the ones found in Donkey Kong Country 2. Even though they are immune to jump attacks, Spinies can also be defeated by teaming up and throwing Diddy or Dixie at them. And although their quills prevent jumping, Rambi and Rattly can jump off one harmlessly. Hedgehog enemies similar to Spinies, called Bristles appear in Donkey Kong Country 3: Dixie Kong's Double Trouble! and Donkey Kong Land III. Sprite from Donkey Kong Country 2. This page was last edited on November 28, 2018, at 13:34.